U.S. warns allies Trump will take Jerusalem vote "personally"
UNITED NATIONS -- President Trump will be watching a vote in the United Nations General Assembly "very carefully," and has asked his ambassador to the world body, Nikki Haley, to "report back on those countries who voted against us," Haley wrote in a letter sent Tuesday to some countries. The letter has been obtained by CBS News. Haley also sent a tweet warning the U.S. would be "taking names" in Thursday's scheduled vote, which is intended to show a United Nations unified around getting President Trump to withdraw his administration's unilateral recognition of Jerusalem as the capital of Israel. With the letter and the tweet, Haley is pressing other countries to stand by the U.S. decision, hoping for a better result than in last week's vote on a similar resolution in the Security Council which left the U.S. alone against the 14 other Council members. The U.S., as a permanent member of the Council, was able to veto that measure with a single vote. CBS News obtained a copy of Haley's letter from three different nations -- all allies of the U.S. -- but it was sent to the delegations of more than 180 countries in total. Haley wrote that the U.S., "will take note of each and every vote on this issue." She made the point that the Thursday vote is something to take seriously. "As you know, the General Assembly is considering a resolution about President Trump's recent decision on Jerusalem," Haley wrote. "As you consider your vote, I want you to know that the President and U.S. take this vote personally." 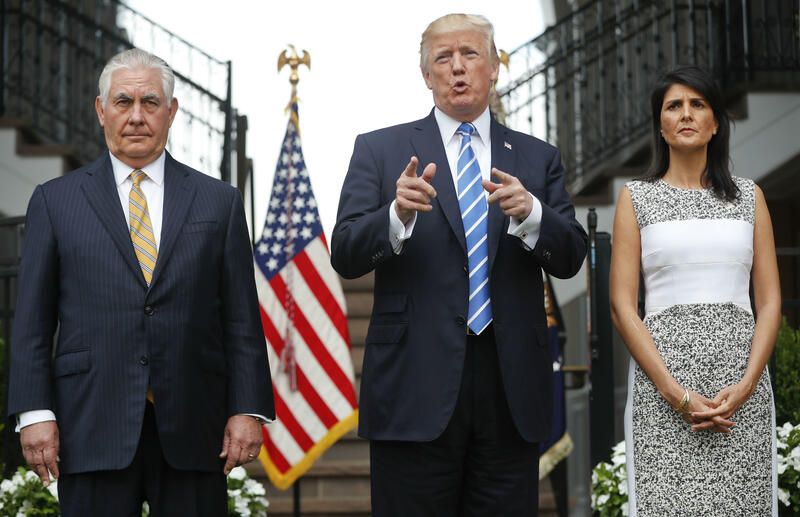 President Trump praised Haley's approach as he met with his Cabinet Wednesday at the White House. "I like the message that Nikki sent yesterday at the United Nations, for all of these nations that take our money and then they vote against us at the Security Council, or they votes against us potentially at the assembly. They take hundreds of millions of dollars and even billions of dollars and then they vote against us, well, we're watching those votes. Let 'em vote against us. We'll save a lot. We don't care. But this isn't like it used to be where they could vote against you and then you pay them hundreds of millions of dollars and nobody knows what they're doing," Mr. Trump said in his televised remarks. Macron says he told Trump Jerusalem decision would be "a mistake"
Haley's letter explains the history that 22 years ago, "the U.S. Congress declared that Jerusalem should be recognized as the capital of Israel, and that the U.S. Embassy should be located in Jerusalem. President Trump affirmed that declaration by officially recognizing Jerusalem as the capital of Israel." The letter also explains the overall U.S. policy. "The President's announcement did not prejudge final status negotiations in any way, including the specific boundaries of Israeli sovereignty in Jerusalem. The President also made sure to support the status quo at Jerusalem's holy sites, and did not advocate changes to the arrangements at the Temple Mount/Haram al-Sharif." The Jerusalem resolution to be presented to the General Assembly on Thursday is similar, although not identical, to the one presented to the Security Council last week. In the Security Council vote, the United States vetoed the United Nations Security Council draft resolution that was proposed by Egypt and called for the reversal of Mr. Trump's recognition of Jerusalem as the capital of Israel. How will the Jerusalem announcement affect peace negotiations? "Our hand remains extended to both parties ... We call on all countries that share this commitment to learn the hard lessons of the past and work to bring Israel and the Palestinian people in good faith to the peace table," she said. The resolution to be presented on Thursday to the General Assembly is brought under a rarely used 1950 resolution called "Uniting for Peace" that has a provision that would give authority to the 193-nation body to act when the Security Council is deadlocked. The point of both resolutions, negotiators said, is to show that the U.S. stands alone on the Jerusalem recognition. The draft resolution expresses regret at recent decisions concerning the status of Jerusalem -- without mentioning the U.S. or Mr. Trump -- and states that any decisions to change the status of Jerusalem are "null and void," that it has "no legal effect" and "must be rescinded." It also called on countries not to establish diplomatic missions in the city. Nickolay Mladenov, the U.N.'s special coordinator for the Middle East said, "in the wake of the decision of the United States to recognize Jerusalem as the capital of Israel, the situation has become more tense with an increase in incidents, notably rockets fired from Gaza and clashes between Palestinians and Israeli security forces." Following Mr. Trump's decision to recognize Jerusalem as Israel's capital, Haley said in early December the U.S. still has credibility as a mediator with Israel and Palestinians. The Palestinians, however, have declared Mr. Trump's move a "crime," and said the U.S. no longer has any role to play in a Middle East peace process. Peace talks in the Middle East have stalled, although the so-called "Middle East Quartet" still is in place. It includes the U.S., Russia, the European Union and the United Nations. In Haley's letter to her fellow ambassadors, she explained "the U.S. announcement is an acknowledgement that peace is best advanced, not set back, when all parties are honest with each other about the basic facts. Jerusalem has been the capital of Israel since the country's founding nearly seventy years ago." "To be clear," she wrote, "we are not asking that other countries move their embassies to Jerusalem, though we think it would be appropriate. We are simply asking that you acknowledge the historical friendship, partnership, and support we have extended and respect our decision about our own embassy."